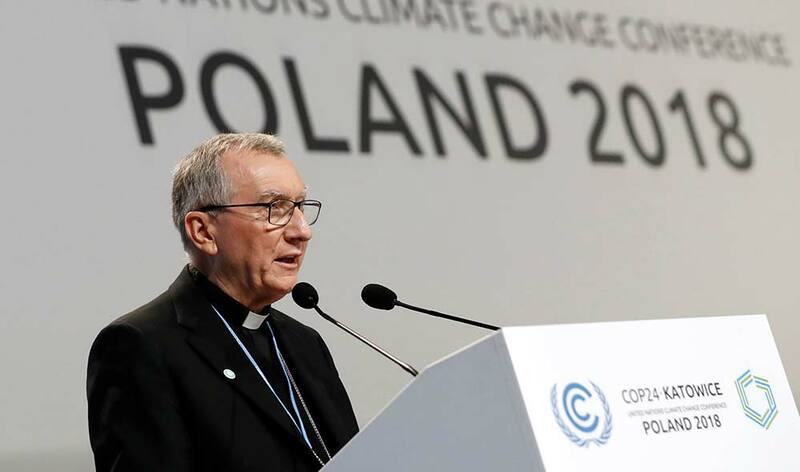 Cardinal Pietro Parolin, Vatican secretary of state, addressed the conference, COP24, in Katowice, Poland, Dec. 3 and told participants, "We are standing before a challenge of civilization for the benefit of the common good." Speaking at a Dec. 3 news conference, U.N. Secretary-General Antonio Guterres said commitment to combat climate change was "felt in all religions," and he praised the "very positive position" of Pope Francis on the issue. She said CIDSE had joined other faith-based organizations in a Dec. 2 interreligious forum at Katowice's St. Stephen Church to coordinate a "generate input" to the conference, which runs until Dec. 14 and is expected to agree on implementation guidelines for a 1.5-degree Celsius limit on temperature increase, adopted under the 2015 Paris Climate Change Agreement. Churches and religious groups are to stage a Dec. 8 climate march and joint "day of reflection, celebration and commitment renewal" Dec. 9 in Katowice's Catholic cathedral, organized by the Katowice Archdiocese, CIDSE, Caritas Internationalis, Franciscans International and the Global Catholic Climate Movement. "It's important now to keep public opinion mobilized through external events, so those involved show courage, feel supported in their work and interact with civil society, rather than taking policy decisions in a bubble," Gauthier told CNS Dec. 4.